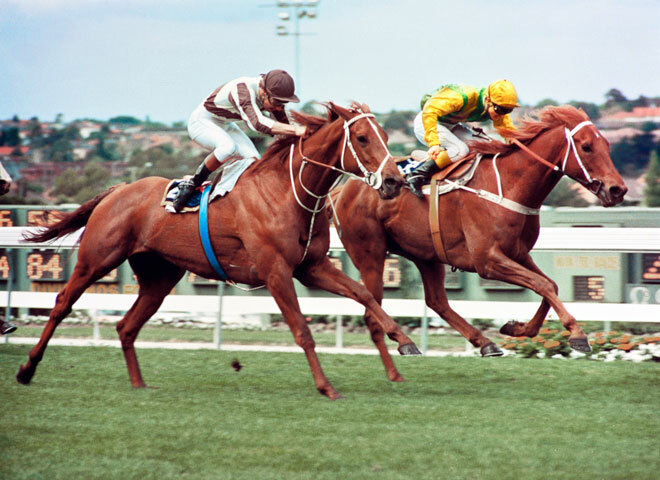 Bonecrusher (left) edges out Our Waverley Star to win the 1986 W. S. Cox Plate. Bonecrusher became a household name in the 1980s, and was named an official sporting ambassador for New Zealand. Winning 18 races out of 44 starts during his career, he is best known for his triumph in what was later dubbed the 'race of the century'. In the 1986 W. S. Cox Plate at Moonee Valley, he battled against fellow New Zealand horse Our Waverley Star. As they entered the home strait, Bonecrusher had a slender lead but Our Waverley Star closed in and looked as if he was going to pull ahead. With great determination Bonecrusher fought off the challenge, winning by a neck.